Broker/Owner Brian Molisse is pleased to announce that The M+M Realty Team were awarded with Top Closed Sales and Top New Listings for the month of March. The power team of M+M is a collaboration of REALTORS® Fran Marci-Glenn and Lizanne Moffatt. 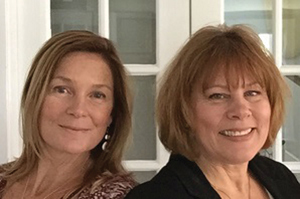 Fran and Lizanne have both been selling real estate on the South Shore for over 20 years. Fran comes with a background in fabric design and can offer tips on staging a home for sale. She has an eye for the perfect camera angle and comes back time and again to get the right lighting that showcases the details of your home. Fran consistently follows up with all leads and potentially interested parties. Professional and courteous at every step, Fran sets her sights on your success and will be there every step of the way. With an arsenal of fresh marketing ideas and new approaches to the job of pairing homes with families, Lizanne will be there to take you right to the closing table. Lizanne approaches real estate on the South Shore with an honest appreciation of the area. Her business is hyperlocal, with a keen awareness of the different nuances of selling from town to town in our area. That enthusiasm coupled with negotiating skills can help you achieve your real estate goals whether you are a buyer or a seller. When you work with the agents of Molisse Realty Group, you get a team of individuals who will do all they can to assist you with buying and selling your home. The goal of all of our agents is to provide the best possible service to our clients and customers. The M+M Team can be reached at 781-566-0019 or MandM@MolisseRealty.net. Visit their website ReallyGreatRealEstate.net. Office is located in Marshfield on 23 Snow Rd. Hi I am very interested in purchasing a home in the South Shore. Love this article and interested in speaking with the M + M Team. Thanks!